Under the immense pressure from anti-nuclear activists, the lawmakers from the ruling Kuomingtang (KMT) party and opposition party the Democratic Progressive Party (DPP) decided to suspend moving forward with a referendum on the island's fourth nuclear power plant  until September 2013, according to local news report  on August 6. The ruling party was determined to solve the controversy over the fourth nuclear plant by means of a referendum because opinion back in February showed that those opposed to the plant were less than 50 percent  across Taiwan. And hence, the Executive Yuan proposed the referendum on the nuclear power plant on February 25, 2013. But some argue  Taiwan's tough referendum law is unfair, requiring 50 percent of voters to participate in the referendum or else the proposal in the referendum will be rejected, even if those who have voted reach a majority consensus. In the last ten years, six national referendums have been proposed, but none of them was passed. 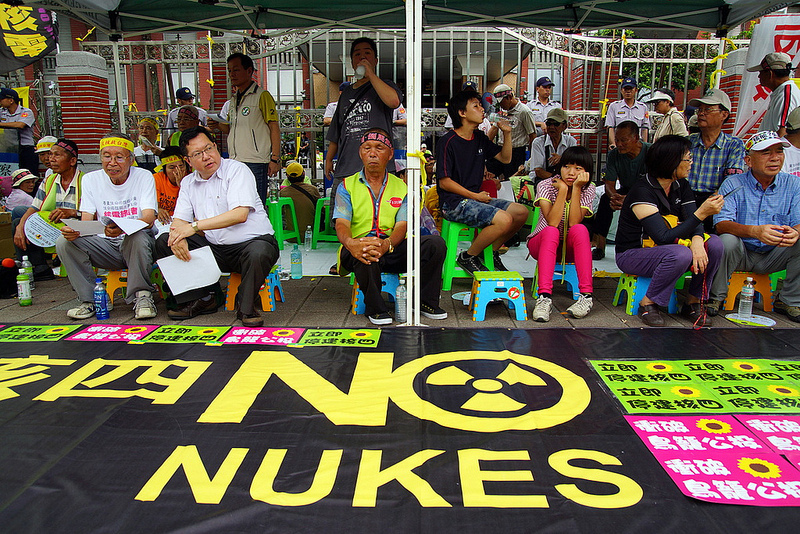 Anti-nuclear activists responded by mobilizing citizen campaigns in major cities for a nuke-free Taiwan. This latest development is a temporary victory for anti-nuclear activists. March 9 anti-nuclear rally in Taipei city. Photo taken by 孫窮理, coolloud.org.tw. Non-commercial use. Outraged by the government's referendum proposal, on March 9, 2013, around 200,000 250,000 protesters  [zh] rallied in Taipei, Taichung, Kaohsiung, and Taitung, demanding the government stop the nuclear plant without going through the referendum. The number of protesters has broken the record of all previous mobilization on environmental issues. The mobilization has some visible effects on public opinion. As cultural critic Chang Tie-chih pointed out, the anti-nuclear effort has developed into a citizen-initiated movement  [zh] for a nuke-free Taiwan. Taiwan Anti-Nuclear Action Coalition (台灣反核行動聯盟 ) – the page is for organizational networking. 2013 Stop Nukes Now (2013廢核大遊行 ) – a page for recording and coordinating anti-nuclear protest. 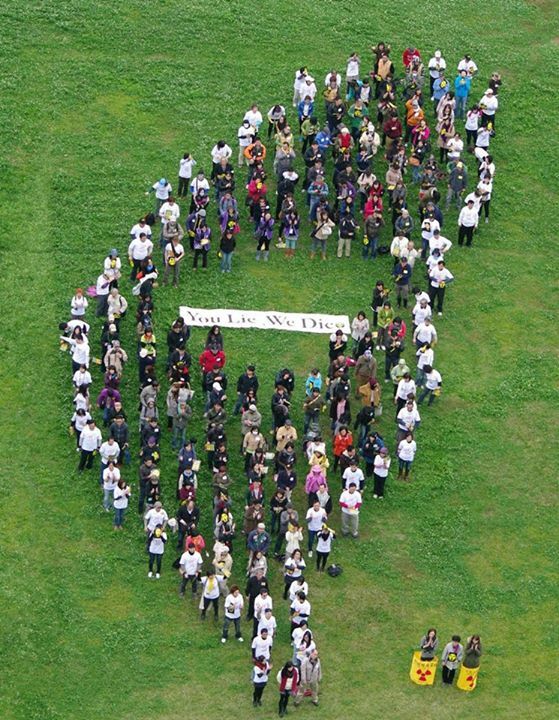 Anti-Nuclear Out of Love (為了親愛的你，我反核 ) – the page collects personal photos that express love and anti-nuclear messages. Coalition of Mothers for the Monitoring of Nuclear Plants (媽媽監督核電廠聯盟 ) – a page to recruit mothers active against nuclear. Coalition to Determinate the Fourth Nuclear Plant with a Vote (終結核四催票大聯盟 ) – a page to mobilize Taiwanese to vote in the referendum against the fourth nuclear plant. I Am Human, I Am Against Nuclear (我是人，我反核 ）- the page coordinates weekend activities against nuclear power. 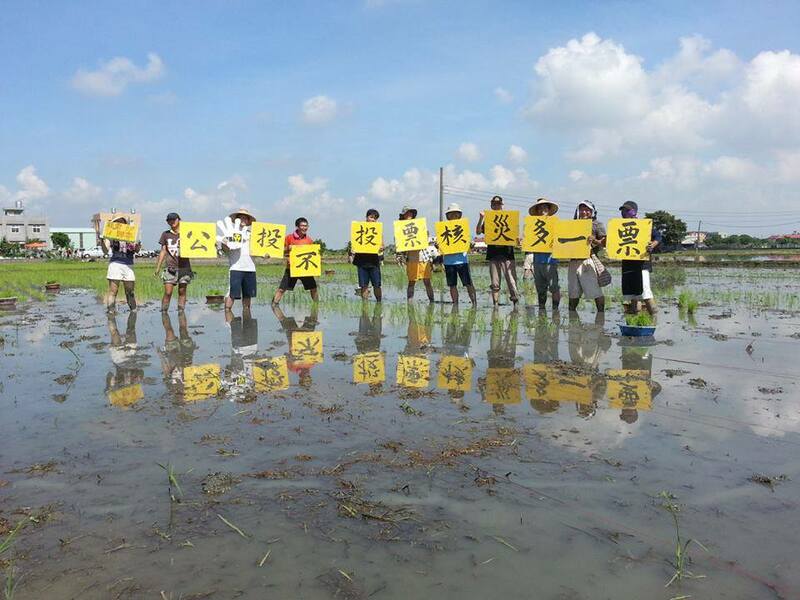 No More Nuke 4 or 5 or 6 in Yilan (宜蘭不要核456運動 )- a page devoted to local Yilan mobilization against future nuclear plants. I Am a Dog, I Am Against Nuclear（我是狗，我反核 ）- a page to remind people that animals and all living creatures are victims of nuclear accidents. Anti-Nuclear Army (反核部隊 ）- a group for coordinating and sharing anti-nuclear flash mob action. Disregarding people's wish for a nuke-free Taiwan, on April 26 the government submitted the referendum proposal to the Legislative Yuan for a second reading and lawmakers had one month for internal discussion and negotiation. 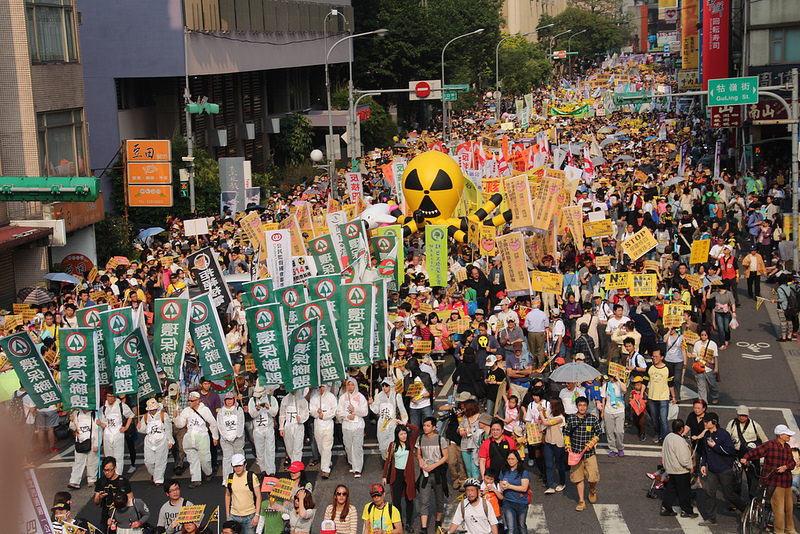 Anti-nuclear groups responded with a rally in Taipei city on May 19. When the one-month negotiation period came to an end on May 26, activists surrounded the Legislative Yuan  [zh], demanding the lawmakers put an end to the nuclear plant project. On August 2, the referendum proposal was submitted to the Legislative Yuan for a second and third reading but lawmakers from the opposition Democratic Progressive Party occupied the chairperson's stage and stopped  the vote. Protesters demonstrated outside the Legislative Yuan in August 2 against the fourth nuclear plant and the referendum. Photo taken by 陳逸婷, coolloud.org. Non-commercial use. Anti-nuclear activists are prepared with two strategies. On one front, they protested outside the Legislative Yuan and explained to the public the problem of existing referendum law. On another, they also prepared to mobilize and win the referendum despite the rule of the game being unfair to them. 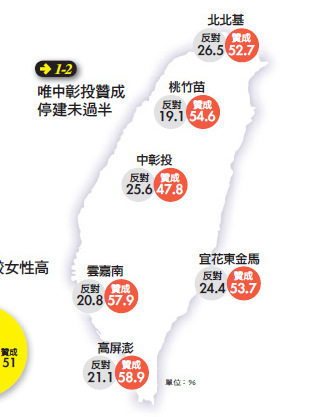 By August 1, a survey conducted by a marketing company on “The Trend of Taiwan Society” [zh] showed that 70% of the opinion is against the development of nuclear plant. Considering the majority of the citizens agree on ending construction of the fourth nuclear power plant, the legislators should stop the construction to reflect our opinions and fulfill their duty as our representatives in the Legislation Yuan. We should not wait for the national referendum to bother all of us. First, they should accomplish the report of current construction quality of the fourth nuclear power plant and confirm that it is worth our tax money so that we can consider continuing the construction. Second, they should amend the Referendum Act. The threshold stated in this Act should be lowered to reflect citizens’ opinions faithfully. We ask the legislators to fulfill these requirements before they vote. They should not vote for the referendum now without sufficient preparation. We also ask the legislators who support the no-nuke activities to avoid the referendum going through the voting process. Secretary General of Green Citizens Action Alliance Tsui Hsiu-Hsin […] emphasized that the protesters are ready for the referendum. They will fight the government face-to-face through organizational mobilization. The placard said: “If you don't vote for the referendum, you vote for nuclear disaster.” via Facebook 洪雅書房. Public photo. Now that the Legislative Yuan has agreed to suspend voting on the referendum proposal, the anti-nuclear activists will continue to pressure the government to stop the fourth nuclear power plant from operating with its administrative power.